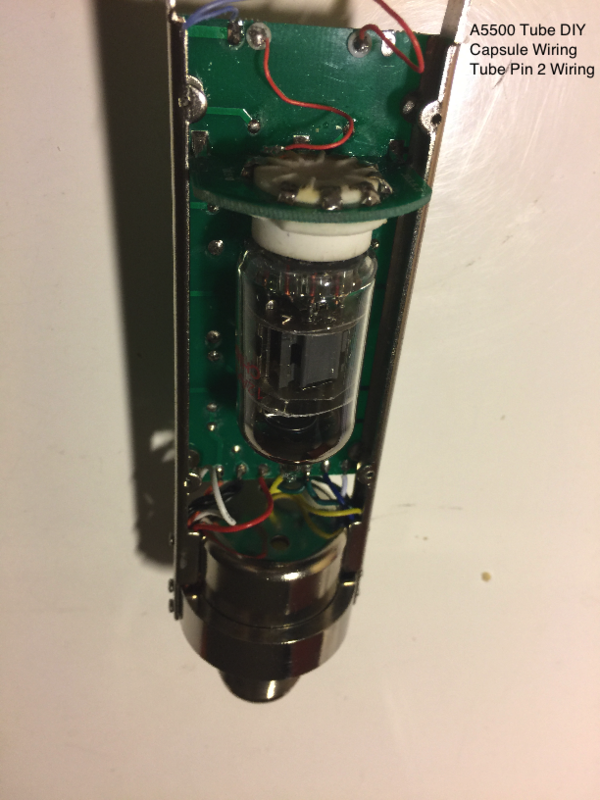 In the tube mic DIY kit, a capsule is preinstalled in the grilled head, and a transformer and a 7-pin connector are preinstalled in the base. There are two PCBs. The small one is for the tube connector, and the big one is for the pre-amp. The tube connector, resistors, and capacitors are packed separately. To assemble the parts into a tube microphone, please following the steps. 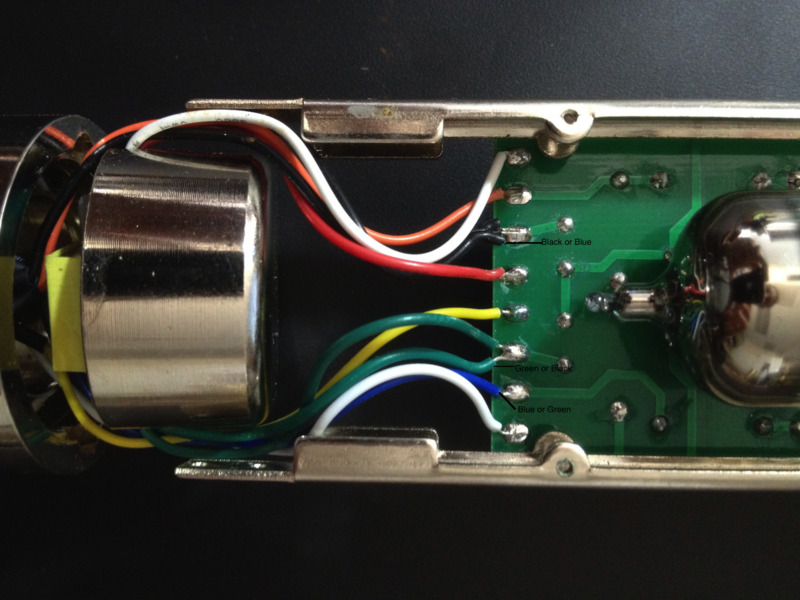 These steps are applicable to both single or multi polar pattern tube microphone DIY kits. First insert the tube socket into the tube PCB, and solder all pins of the tube to the tube PCB. Then solder the tube PCB onto the main PCB. As shown in the following two pictures. Notes: It is not neccessary to use any wires to bind the tube PCB to the main PCB. Good solsering will provide enough mechanical support to the tube PCB. The soldering should also provide good electrical connections between the two PCBs, which is critical because all pins of the tube are connected to the main PCB through the connections between the two PCBs. Every resistors and capacitors are indicated as R1, R2, ...., and C1, C2, ... in the schematics, and on the PCB, accordingly. It is very important to put them into the right spots. Putting any one of them into a wrong place will consume a lot of time to find it out. Now you need to solder the 10 wires from the microphone base onto the PCB. The color scheme of the wires are shown in the following table, but please be aware that this is only for your reference. The actual colors from each pin and from the transformer may vary. You need to figure it out yourself. First use a multimeter to measure the resistance between each pin of the 7-pin connector and each wire. When the resistance is close to zero, mark the wire accordingly. The four wires left should be from the transformer. Then measure the resistance between every two of them to determine the wires for the primary and secondary coils. The resistance for the primary coil should be much larger than the resistance for the secondary one. Then, you need to connect the wires from the capsule to the PCB. The wirings are shown in the following picture. 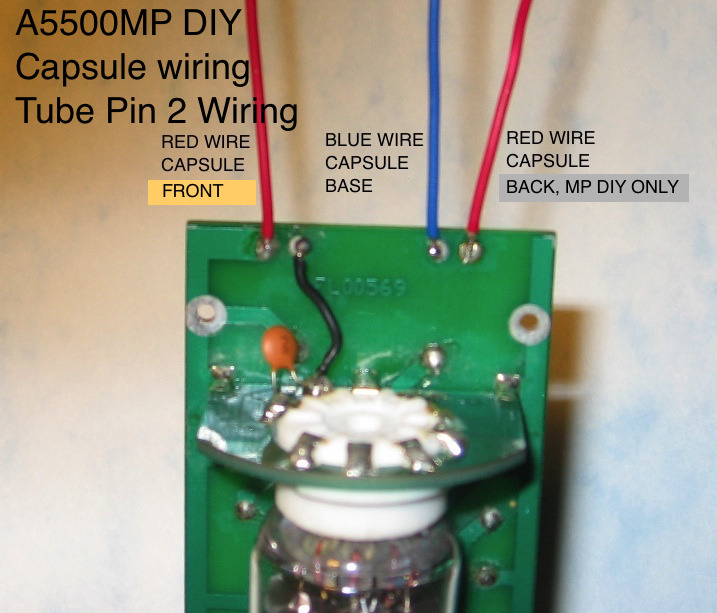 Note that only Tube Mic MP DIY kit has a dual diaphragm and you need to connect the red wire from the back diaphragm to the PCB. If everything is going on correctly, you can hook up the microphone with the PSU, and enjoy recording your song or your music. When something goes wrong, you need to figure out what it is and fix it. You need to go through the following steps. Even if your microphone is working properly, you can still go through these steps, because by doing so, you will learn how and why a microphone works, and the physics laws behind all of these. Gaining these knowledges, you will become a designer, rather than only an assembler, so you can modify your microphone to meet your own specific goal. The circuit in the main PCB is a pre-amplifier for the sound signal from the capsule. The center piece of the amplifier is the tube. The tube takes in a sound signal from the capsule as input, and output an amplified signal to the transformer. In order to amplify the signal, the tube has to be supplied with right DC voltages to its anode and cathode, which is often referred as its DC operating point. 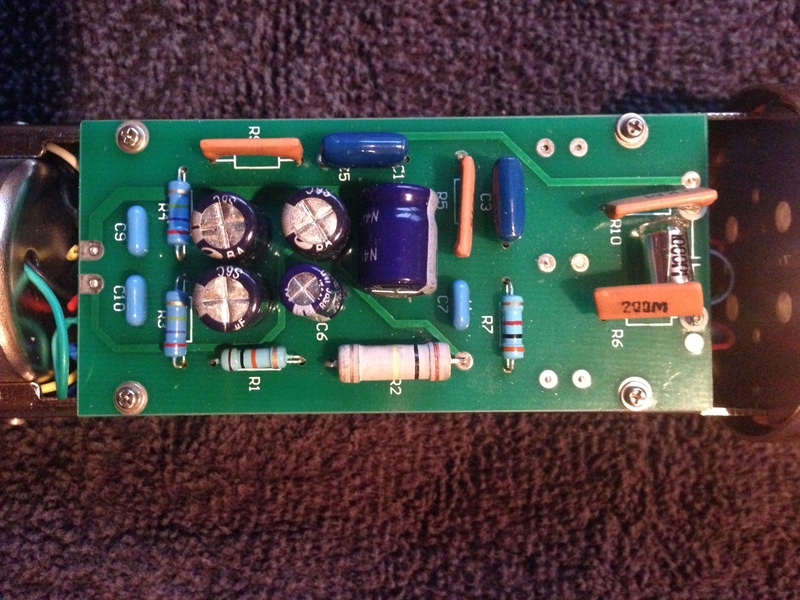 The circuit for the tube mic DIY kit has been carefully designed to ensure the tube is working on an optimal DC operating point. To see if your tube is actually doing so, you need to measure the DC voltages at several points on the PCB. Normally, you need to measure the DC voltages of the points on the PCB indicated in the following picture. Why is the filament voltage too high? The fact that the tube is working on a good DC operating point, does not mean it can amplify sound signals properly. If you get all the DC values in a right range, but you still cannot get good sound from the microphone, you need to go through this step. The sound signals are AC signals, they have there own input and output paths. To check all these AC paths, special instruments are needed, like audio signal generator, and a device which can display and measure audio signals. We are not going into this field here now. We will post some other web pages for this subject later, for the readers who want to lear those advance techniques. The simplest way to do it, without those special devices, is to check if all the two (for single polar pattern) or three (for multi polar pattern) wires from the capsule, and the four wires from the transformer are correctly connected to the PCB, because the capsule and the transformer are in the audio paths. You also need to check if the three capacitors, C4, C6, and C8 are correctly placed on the PCB, because they are also in the audio paths.